Posted on August 27, 2011 by Deli Lanoux, Ed.D. A few days ago, I received a letter with a couple of prayer cards from Father Robert at Franciscan Mission Associates. St. Jude looks more striking than ever in rich earthen tones, I thought. And St. Monica? What a weathered look! Yet she’s beautiful despite her sadness. 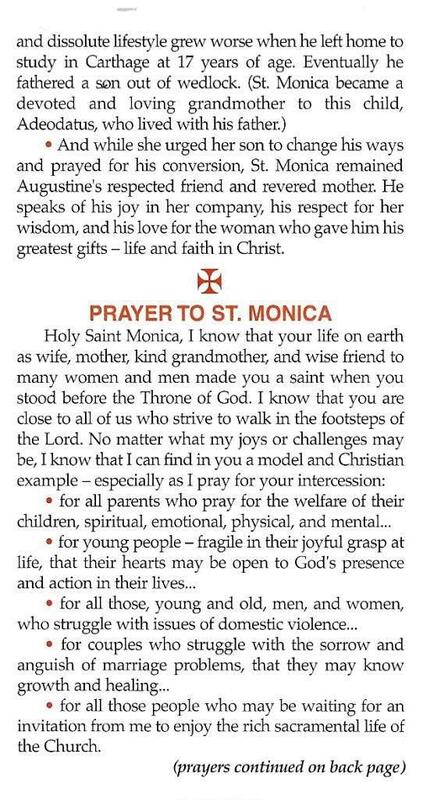 I read St. Monica’s prayer card and set it aside, but her expression stayed with me. I know that look firsthand. In today’s Daily Inspiration, Father Joseph Fogarty, OP focused on St. Monica, too. 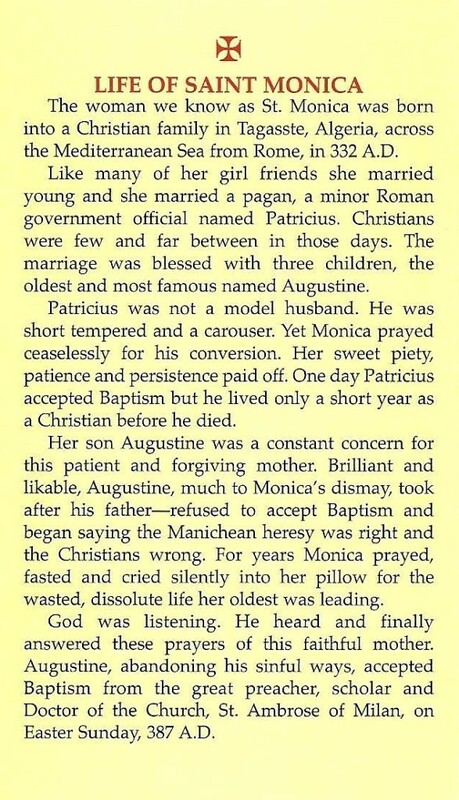 St. Monica, the mother of St. Augustine, was a model of patience. She bore with her husband, Patricius, who had a violent temper, and with her son, Augustine, who lived for [fifteen] years with a woman companion. 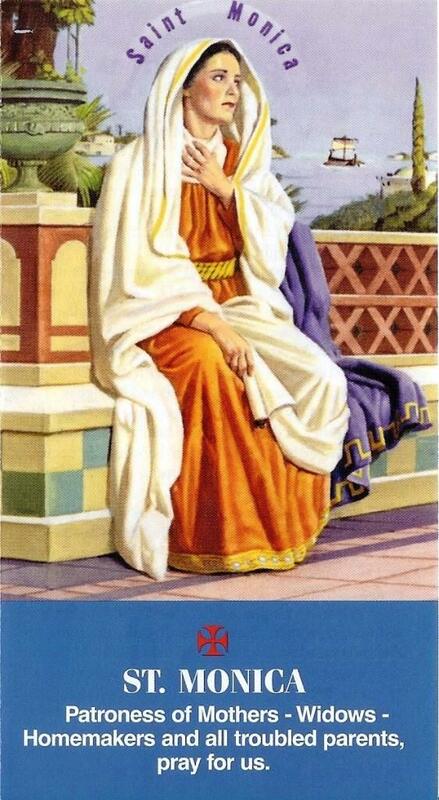 Monica managed to live happily with Patricius, despite his defects. He was baptized in 370. Her son, Augustine, was baptized in 387. She patiently prayed both toward full communion with the community of believers. One of my favorite readings came to mind. 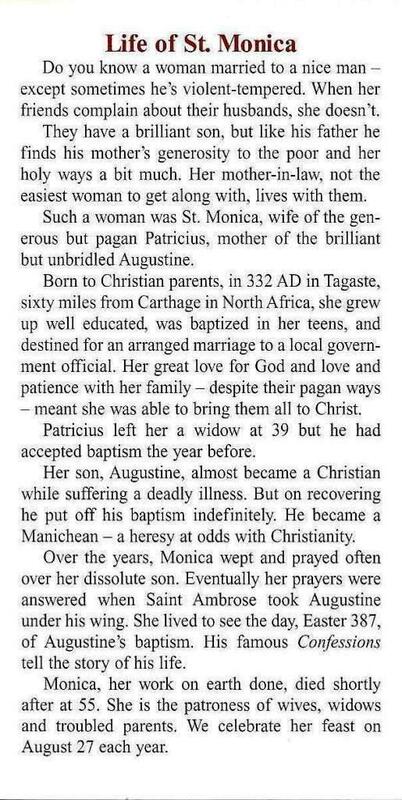 Ever faithful to God and her family, St. Monica bore her crosses with patience. In this respect, she reminds me of St. Helena, who also overcame great adversity. Resilient, courageous, both women are role models to emulate in good times and bad. 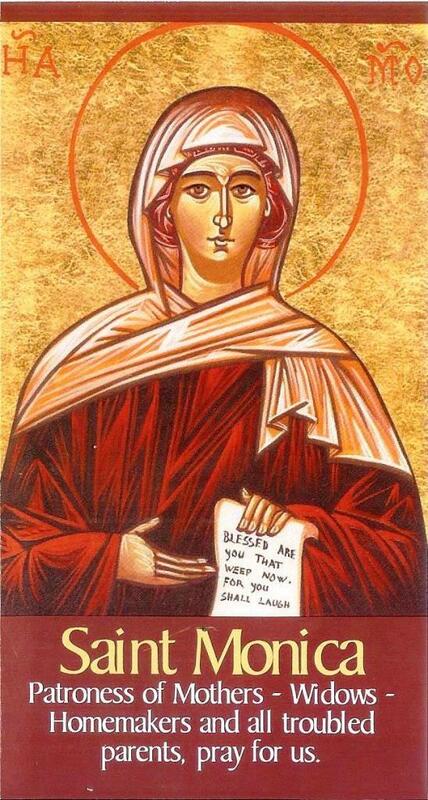 St. Monica’s feast day is August 27; St. Helena’s, August 18. 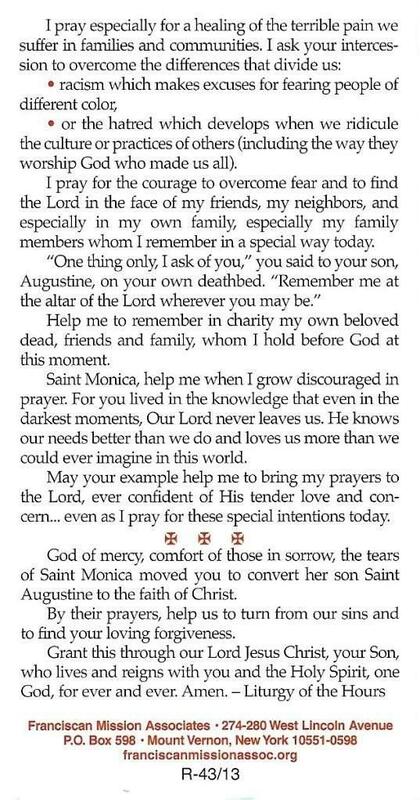 Model of motherly love… O glorious St. Monica, greatly admired among mothers, I feel particularly [drawn] to you who gave such an example of motherly love. Who could understand better than you the anxieties and fears of a mother worrying about the eternal salvation of her children? You endured all, since… St. Augustine is the fruit of your womb and… the fruit of your tears. For this reason I am greatly convinced that… with the sanctity of your life and the perseverance of your prayers, you are not only [a great model] of Christian [motherhood, but also] a singular protector. Obtain for me the grace to imitate your graces faithfully. May my children avoid those errors and failures you disapproved of… in your son. And, if it should happen that they, too, should fall, grant me the grace to obtain (this request…) with my prayers… as perfect a conversion as you were able to obtain for your son. Amen. With your needs, worries and anxieties, you threw yourself on the mercy and providence of God. Through sorrow and pain, you constantly devoted yourself to God. Pray for me that I might join you in such a deep faith in God’s goodness and mercy. 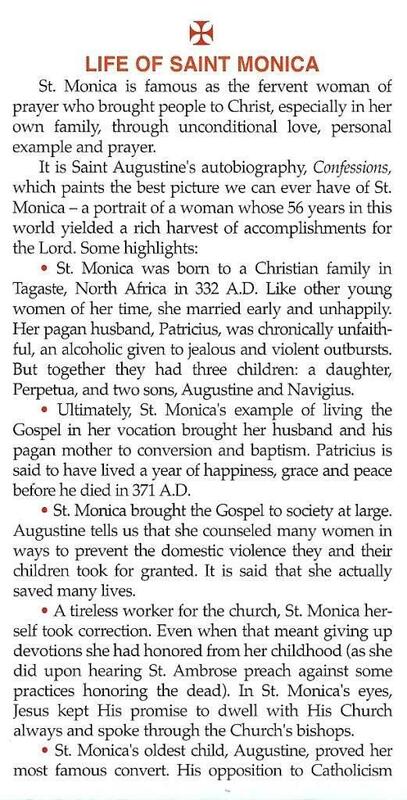 Above all, dear Saint Monica, pray for me that I may, like your son, turn from my sin and become a great saint for the glory of God. Amen. 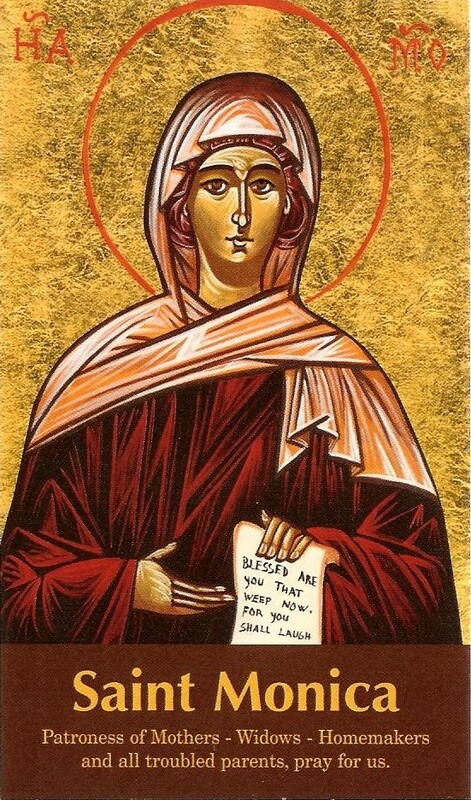 Patience and trust… Saint Monica, prayerful wife and mother, many sorrows anguished your heart during your lifetime yet you never gave in to desperation or lost hope. With enduring tenacity and unwavering faith you prayed ardently for the conversion of your troubled husband and for your beloved son Augustine. God answered your tearful prayers, so I ask that I may be granted the same enduring patience and trust in the Lord. 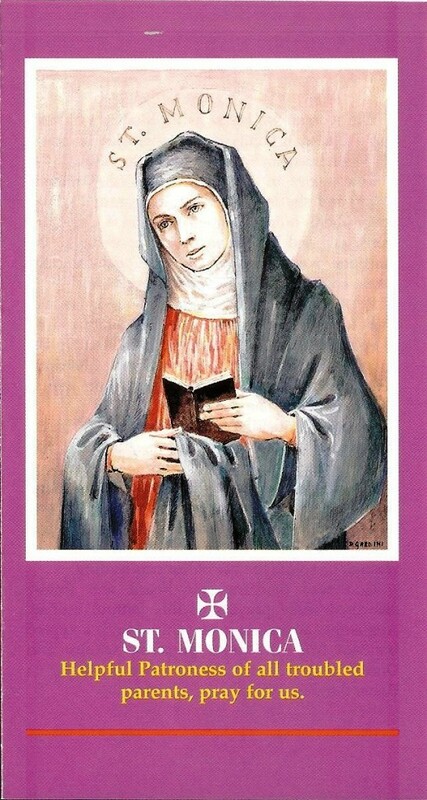 Saint Monica, pray that God may listen to the sorrows of my heart and bless me with the grace to embrace his will for my life. 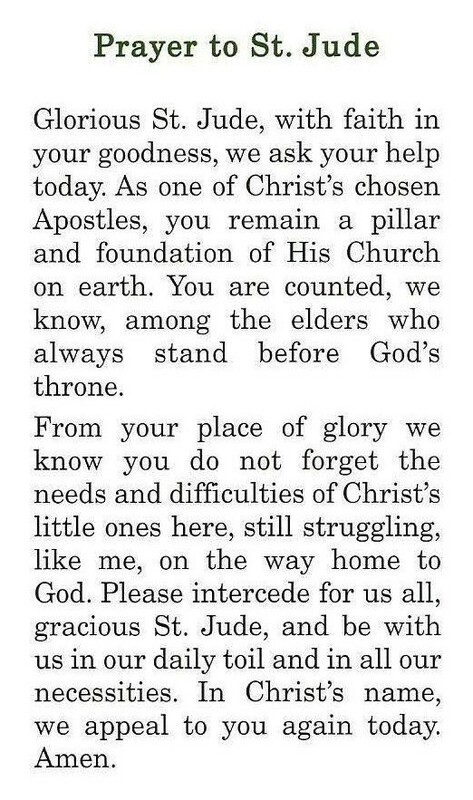 All to the glory of God the Father, the Son, and the Holy Spirit. Amen. 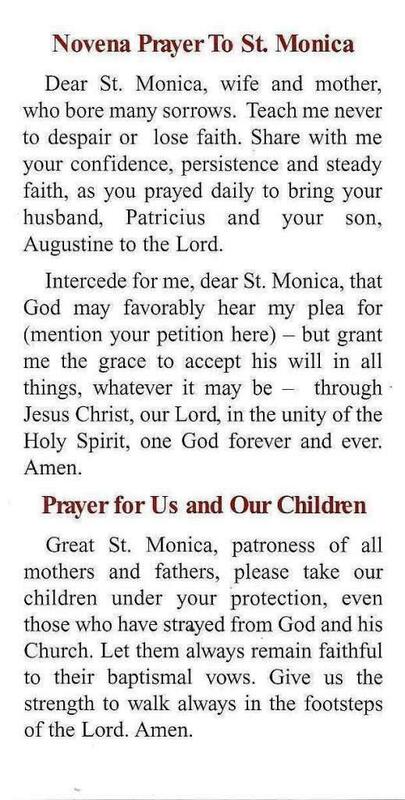 Patron of parents… St. Monica, patron of Christian mothers, we entrust to your protection the children whose names you can read in our hearts. Pray for them that they may be granted strength to combat weakness, victory over temptations, guidance to resolve their doubts, and success in all their undertakings. May they enjoy health of mind and body, see beauty and worth in all created things, and serve the Lord with firm faith, joyful hope, and enduring love. Amen. 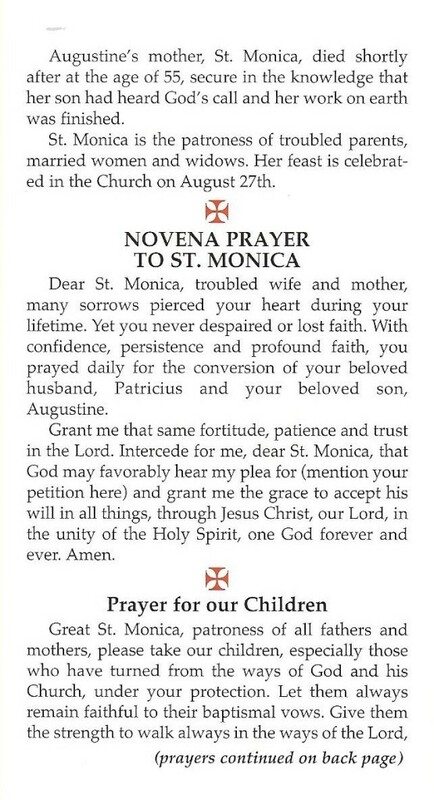 Petition… Dear St. Monica, once the sorrowing mother of a wayward son, be pleased to present our petitions to the Lord God of heaven and earth. Look down upon our anxieties and needs, and intercede for us as you did so fervently for Augustine. We have full confidence that your prayers will gain a favorable hearing in heaven. Mother of a sinner turned saint, obtain for us patience, perseverance, and total trust in God’s perfect timing. In his appointed hour, in his merciful way, may God respond to [our] prayers. (State your petition.) Amen. 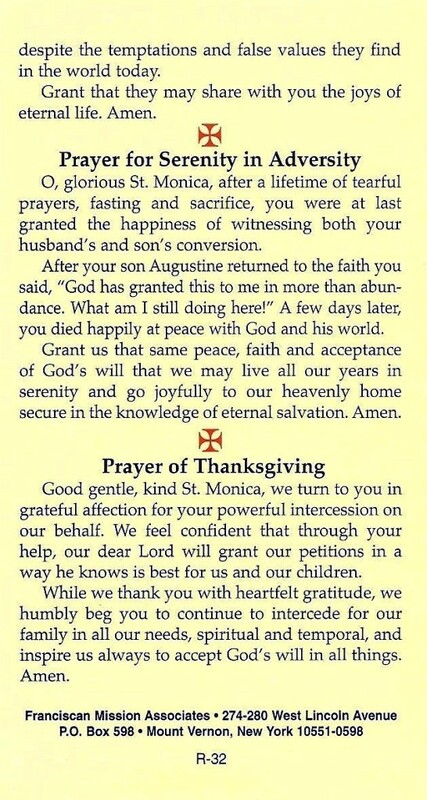 Prayers to St. Monica are from Favorite Patron Saints (The Leaflet Missal Company, n. d., pp. 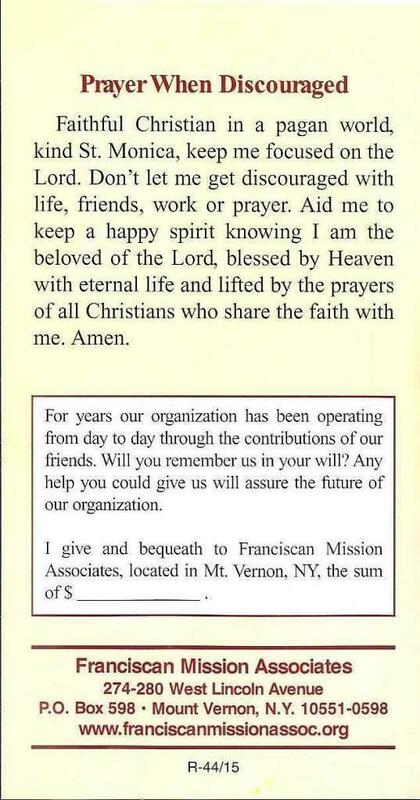 18-19); the leaflets, from Father Primo at Franciscan Mission Associates, P.O. 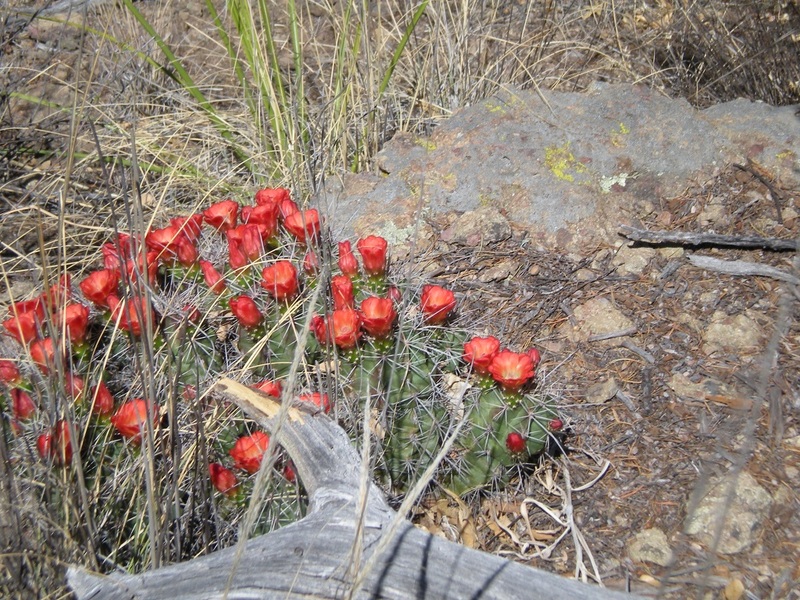 Box 598, Mt. Vernon, NY 10551-0598. 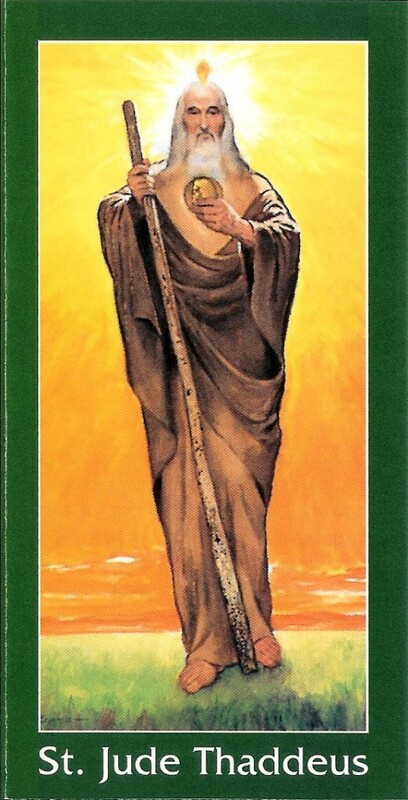 Another of my favorite readings, which goes hand in hand with love and forgiveness, is good for all time, too. For a brief moment I abandoned you; but with great tenderness, I will take you back. In an outburst of wrath, for a moment, I hid my face from you; but with enduring love I take pity on you… so I have sworn not to be angry with you or to rebuke you. Though the mountains leave their place and the hills be shaken, my love shall never leave you (Isaiah 54:7-10). “Lord, show me the treasures you have placed in all the people around me— especially those I find hardest to love!” (the Word among us, November 2012, p. 23). Lord, lift the veil that keeps me from seeing how precious people are in your eyes. Help me to see your love for every person, and give me the compassion and the courage to extend your love to them (the Word among us, April 2013, p.23). Jesus, touch my heart and shape my mind with your word! Teach me, Lord, so I can stand firm in your truth no matter what happens (the Word among us, p. 24). Lord, give me your eyes that I may see my neighbors as you see them. Give me your heart that I may love them with your love (the Word among us, May 2013, p. 40). 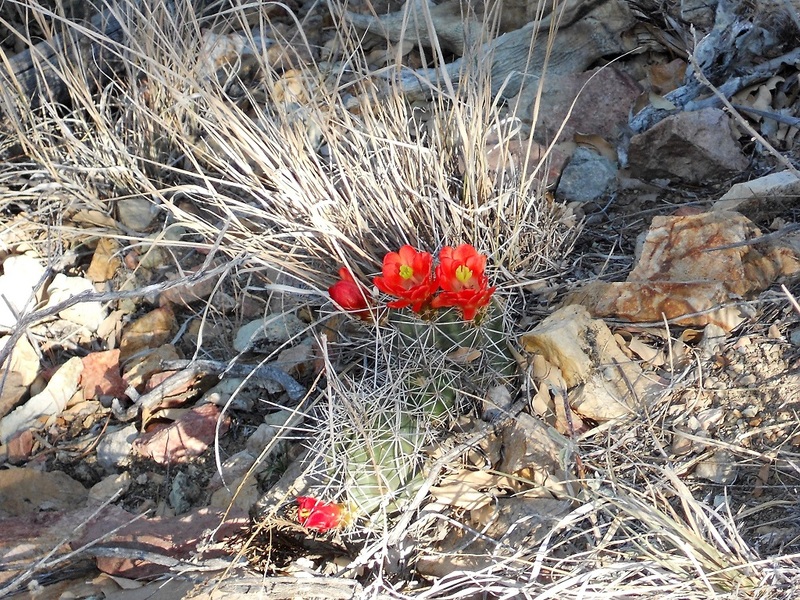 “Jesus, help me to reach out to those who are searching for you” (the Word among us, June 2013, p. 26). Father, help me to remember that my enemies are your friends. I bring their needs before you now (the Word among us, p. 38). Thank you, Lord, that I don’t have to qualify for your mercy. Let this awareness help me to love you more— and to love others as you have loved me (the Word among us, July/August 2013, p. 39). Jesus, thank you for you patience with me. Help me to be patient with other people. Teach me to focus on loving them instead of correcting them. I trust you to work out the details (the Word among us, p. 62). “Jesus, help me to exercise the power to forgive and to reconcile; to set free and to pronounce blessings on myself, my family, my friends, and even my enemies” (the Word among us, p. 64). “Father, help me be just as generous as you are with all who are joining you in the vineyard” (the Word among us, p. 71). “Lord, teach me to love all of the people you put around me with all my heart” (the Word among us, p. 73). Lord, guide my footsteps and strengthen me for the challenges that I will face in your name. Thank you for loving me so much that you give me the honor to do your will on earth (the Word among us, October 2013, p. 40). Jesus, thank you for loving me even when I turned away from you. Bring everyone— even those who seem far away from you— into your embrace (the Word among us, p. 51). Lord, fill me with your love. Help me look at the people around me the way you look at me (the Word among us, November 2013, p. 24). Lord, help me recognize all the goodness and knowledge that you have already given me. Help me use these gifts to grow into the person that you want me to become (the Word among us, p. 29). If you will always assume [that] the person sitting next to you is the messiah waiting for some human kindness, you will soon learn to weigh your words and watch your hands. And if he so chooses not to reveal himself in your time, it will not matter (Dosick, 1995, p. 50). “Love covers a multitude of sins” (1 Pt. 4:8). 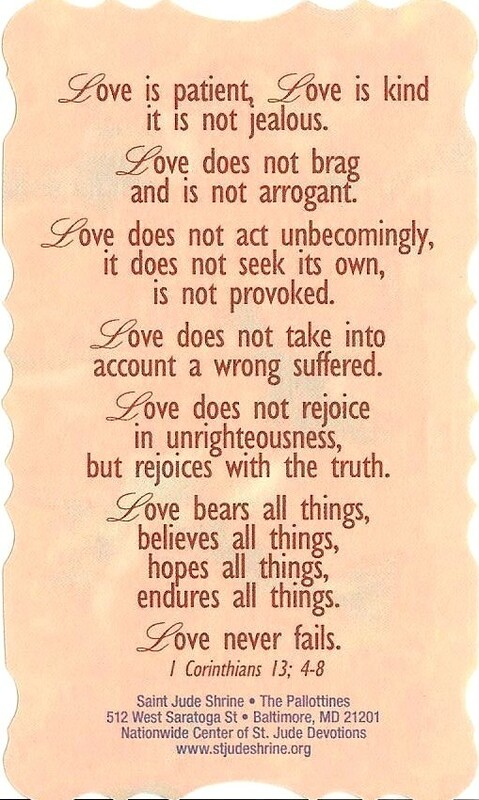 So put on love! Love knows it’s not perfect yet, so it makes allowances for other people’s mistakes and forgives their wrongs. Love knows its understanding is limited, so it looks upon other people with respect and tries to learn from them. Love knows the world is full of hurtful words and deeds, so it tries to make the home a haven of kindness and gentleness. 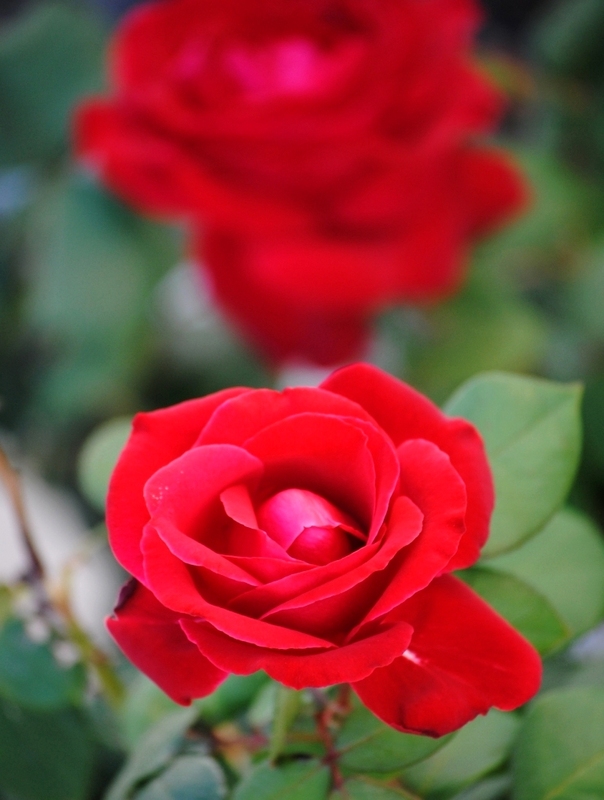 Love realizes that growth takes time, so it practices patience. Love gratefully welcomes and treasures every family member, looking for the good in them, however deeply it may be buried (the Word among us, Advent 2013, p. 47). Resurrectio Domini, spes nostra! The resurrection of the Lord is our hope! (St. Augustine). When night comes and retrospect shows that everything was patchwork and much that one had planned left undone, when so many things rouse shame and regret, then take all as is, lay it in God’s hands, and offer it up to him. In this way we will be able to rest in him, actually to rest, and to begin the new day like a new life (St. Teresa Benedicta of the Cross / Edith Stein; translation, 1987). “Let us understand that God is a physician and that suffering is a medicine for salvation, not a punishment for damnation” (St. Augustine). I beg you, join with me in love. Run with me in faith. Let us yearn for our heavenly home. Let us sigh for it. Let us realize that we are strangers here below (St. Augustine). “To know whom to avoid is a great means of saving our souls” (St. Thomas Aquinas). 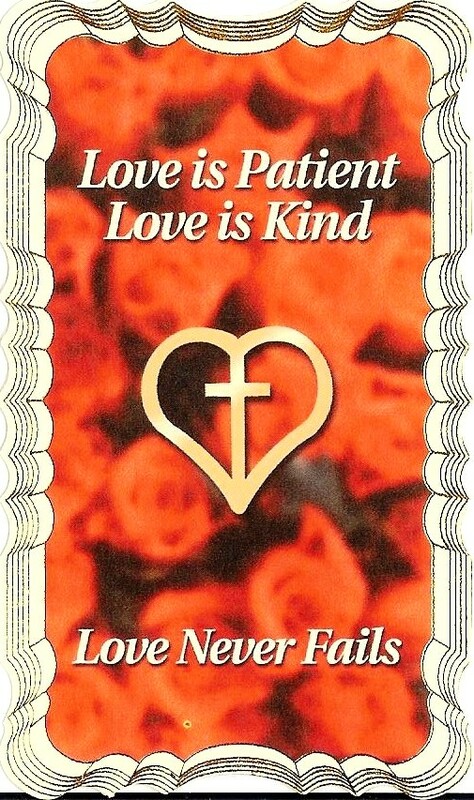 “Endeavor to be patient in bearing the defects and infirmities of others of whatever kind, for you also have many things which others must bear with” (Thomas à Kempis). I will not live an instant that I do not live in love. Whomever loves does all things without suffering or, suffering, loves his suffering (St. Augustine). 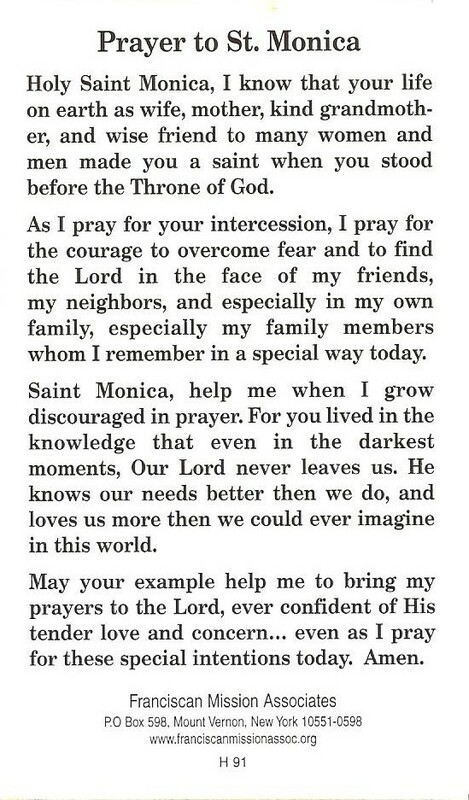 St. Monica. Read her life and you will there see the care she bestowed on her Augustine and find much to console you (St. Francis de Sales). “Let us pray for peace, and let us bring it about starting in our own homes” (Pope Francis). Though God hates sin more than any other thing, he loves us poor miserable sinners. He ardently desires the welfare of our souls as if his own happiness dependent on it (St. John Neumann). Pope Francis reminds us that prayer is the best way to overcome blind spots in our attitudes toward others. He doesn’t say it will be easy. But neither does he let us off the hook. If we search our hearts, we know that we’ve all been guilty of that desire to hold someone accountable long after we think we’ve forgiven him or her (Diane M. Houdek in The Hope of Lent). In Christ, even our failures become a source of grace when we accept them in imitation of his humility and courage; even our anxieties become a path to holiness when we ally them with his sufferings. All that we do and say, if it is done and said in Christ, is done and said well, for true wellness is life in Christ (Clayton C. Barbeau in The Father of the Family). In forgiving and pardoning my neighbor, I I make the conscious decision not to “fuss” over and live in the past. I never really forget what you did to me, but I deliberately choose not to keep picking the scab, not to become entangled in the grudge. I choose to free you from the past by electing not to dwell, mention, or remind others of what you did. To use another image, the portal to the past remains in my heart but I make the choice to close the door, lock it, and throw the key away (Albert Haase, OFM in Instruments of Christ: Reflections on the Peace Prayer of Saint Francis of Assisi). Sweet Klaus, I’m so glad that you had a wonderful vacation by the water with all those lovely trees and plants. It looked most inviting! I hope it was restful and quite memorable. My best regards to you and yours, Deli.